AS THE NEW SCHOOL YEAR APPROACHES, we are all reminded of the class pictures that come along with it. We know our children face so many other pressures in school, feeling insecure about their smile shouldn’t be one of them. To ensure our kids are always smiling confidently in these pictures, consulting an orthodontist from an early age is important and helps detect and correct issues early on. A beautiful smile is truly a boost of confidence for a person, no matter what age. According to Dr. Colallilo, the American Association of Orthodontics recommends children first see an orthodontist at age 7. “At this age, children have a mix of baby (primary) teeth and their adult (permanent) teeth,” he says. “Early treatment for some patients may avoid the possibility of tooth extractions and more serious complications.” Each individual child’s jaw growth and other factors will determine the ideal time for braces. Treatment options have also come a long way in recent years, which is another reason seeing an experienced and qualified practitioner is so important. “Good communication about treatment options is essential as new technology offers the patient a variety of choices including early treatment, clear plastic retainers (commonly known as Invisalign) and more traditional braces which are available in ceramic (tooth colored) and traditional metal finishes,” Dr. Colallilo says. His offices offer all of the traditional treatments, as well as some of the more advanced options. 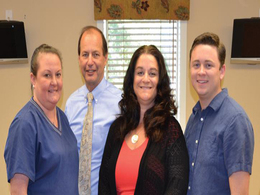 “We provide all options including clear aligners, traditional braces, self-ligating, ceramic braces and metal braces. Each option has pros and cons depending on the patient’s needs, so it is important for the patient to discuss the details with his or her doctor,” he says. But orthodontic treatment goes beyond smiles. It can also impact other areas of a person’s health, says Dr. Colallilo, and can be particularly beneficial to adults. Patients who suffer from these issues may consider treatment options like snoring or sleep apnea appliances. No matter what treatment you are receiving, Dr. Colallilo believes in recognizing each patient’s efforts as part of the plan he’s set them on, since there is a lot of responsibility placed on patients in between visits. His offices regularly recognize a patient of the month. “It gives us a chance to make someone feel special in the way that they are participating in the treatment plan. Recognition in the form of gift certificates to the patient is always well received,” he says.